Making desktop computer–only e-learning is a thing of the past. Today’s learners are device-agnostic. They use whichever device they have on hand at that moment, whether it’s a laptop, a tablet, or a smartphone. If you want to get your training into the hands of the people who need it, you have to make sure it works on any device. If you’re reading this article, you’re probably already as convinced of this as I am. But just because you’re on board with the idea of multi-device e-learning doesn’t mean you know how to make it a reality in your organization. Here are some in-depth tips to help get you started and ensure a smooth transition into multi-device e-learning creation. How will your design and development workflow change? How will you make sure your courses are easy for mobile learners to use? make your efforts successful? If so, how can you get that support? Are your learners prepared for multi-device e-learning? Use this helpful checklist to find out. Is your organization prepared for multi-device e-learning? Fill out this table to get your answer. Shifting your organization to multi-device e-learning doesn’t have to be a huge undertaking, but it’s crucial to think about some of these things ahead of time if you want to ensure a smooth transition. The two most widely used approaches in multi-device e-learning are web-based and slide-based learning. But how do you know which approach to adopt? Great question! The good news is, you don’t have to use the same approach for every project. Rather, you can switch between the two depending on your content and the learner’s needs. Let’s take a closer look at these two approaches and how to decide which one is best suited for your project. Slide-based e-learning has been the standard for a long time and is still commonly used today. You can create slide-based courses using apps like Storyline, which allow course designers to design content by placing text, images, videos, and other multimedia objects in specific spots on a slide. Often, the relative positioning of objects is important in slide-based learning. For example, in this compliance course it wouldn’t make sense for one of the characters to suddenly appear above the other instead of side by side. For this reason, slide-based courses can be scaled up or down depending on screen size, but the objects on the slide should stay in the same position. Scenario-based e-learning, like the example above, where it doesn’t make sense for characters and other illustrations to change places. Any other course where relative positioning of objects on the screen is important. For example, if you’re showing a chart with arrows pointing to specific areas. Projects requiring a high level of design customization. One of the downsides of web-based e-learning is that because the content reflows automatically, you have less control over what your content looks like on each device. So if, for example, your client wants the logo to always appear in a specific position, a slide-based approach may a better fit. Web-based e-learning is a relatively new form of online training that’s quickly gaining popularity. Web-based courses look and behave like mini-websites instead of a series of slides where learners click next to advance. In addition to being more intuitive, web-based e-learning is often fully responsive, meaning the content dynamically adapts and reflows depending on the screen size. Some authoring apps, like Rise, allow you create inherently responsive courses easily—no programing skills necessary! Why is responsive design unique to web-based courses? Because unlike in slide-based e-learning, the relative positioning of text and objects in web-based courses doesn’t matter. This makes it easy to reflow the content based on screen size and orientation without distorting the message. If that all seems a little abstract to you, check out this example of a web-based e-learning course made in Rise to get a better idea of what a responsive learning experience is like. Simple, straightforward courses where relative positioning of objects is irrelevant, for example, if you have a text and an associated image but the message remains the same whether the image is above, below, or beside the text. Video-based courses. Since the content is embedded within the video, when the course is reflowed there won’t be any issues. How-to courses. The goal of this kind of course is to help learners understand how to do something. Process, timeline, tabs, and accordion interactions are the perfect way to motivate learners to lean forward and pull the content they need. These kinds of interactions are easy to reflow for different screen sizes without messing with the meaning. Quizzes. Quiz questions follow a standard format (a question with some possible choices), so making them responsive is a cinch! Course Length. If your learners are using mobile devices, it may be because they’re on the go. Which means they might not have time to take a 40-minute e-learning course. Try breaking your e-learning up into smaller pieces so learners can easily finish each course in one sitting. And even if your learners are in the office, chances are they’ll appreciate this approach since it allows them to make use of small amounts of downtime they may have—between meetings, for example. File Size. If your learners are using their smartphones to view your course, they may also be accessing it via a 3G or 4G network. For this reason, you may want to compress images and videos so they download faster. Text Readability. If you don’t want your learners squinting throughout your entire course, choose a simple font that’s clean and legible, even at a smaller size. And while we’re on the topic of size, make sure to choose a font size that will scale well across devices. Depending on the font you’re using, the actual numeric value could be different, but something similar to Arial 16 is a good baseline for comparison. And, of course, when in doubt, test it out! Button Size. Have you ever visited a website that wasn’t optimized for mobile on your smartphone? Trying to click on a button and accidentally clicking on the one next to it is the worst! To avoid inflicting this negative experience on your learners, make sure your buttons are big enough and spaced out enough that they can easily select them. Unfortunately, there’s no universally agreed-upon rule for how many pixels your buttons should be to ensure optimal usability, but there are some helpful tips in this article. Relevance of Graphics. As an instructional designer, you already know that too many decorative graphics can be distracting for learners. That effect is twofold on mobile devices, since the screen real estate is even harder to come by. Take a look at your graphics and cut out anything that doesn’t need to be there. If you’re unsure whether an image is necessary, try taking it out. Does your message still come across as clearly as before? If so, then great! You’ve just streamlined your content. If not, then add it back in. If all that sounds like too much work for you, don’t worry! There’s an alternative. 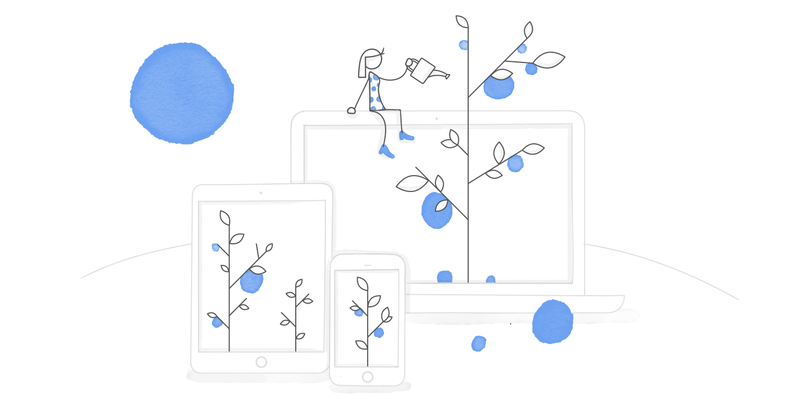 You can use an authoring app like Rise, which takes all the guesswork out of responsive multi-device authoring. All you have to do is plug in your content, and Rise does the rest. All Rise courses are inherently responsive; it’s that simple. Does the app allow you to create courses that look beautiful and work perfectly on any and all devices? Or do you have to use “supported” devices? Limiting learners to specific devices is nearly impossible, so it’s important to choose an authoring software that allows you to build courses that work on any device. Does the app automatically adjust your course so it works on all screen sizes? Or do you have to tweak your content manually? Your time is precious. You don’t want to spend hours making sure your content looks flawless on every possible device your learner may use. Go with an app that does the heavy lifting for you, like Rise or Storyline 360. With Rise you can create inherently responsive courses automatically and then just pop in your content. And with Storyline you can create slide-based courses and the course player automatically resizes depending on the screen size. Does the app optimize screen space by hiding or minimizing non-essential elements (like browser chrome and navigation buttons) on smaller devices? Resizing your course is only half the battle. Have you ever noticed how the navigation on mobile sites is different than their desktop counterparts? It only makes sense that your e-learning course’s navigation be optimized as well, making sure your content is always front and center. Make sure this is a feature your authoring app offers. Here’s a comparison worksheet to help you evaluate the different apps you’ve heard about. And here’s another article with tips on other, more general things to consider when choosing your authoring software: Top 9 Considerations for Choosing the Right E-Learning Authoring App. Making the shift to multi-device e-learning may seem intimidating, but armed with these tips you’ve got everything you need to make the transition a success. Just relax, take it one step at a time, and you’ll be a multi-device e-learning pro before you know it! What Is Responsive E-Learning and Why Does It Matter? If you have any questions or comments, please share them below. And don't forget to follow us on Twitter and come back to E-learning Heroes regularly for more helpful advice on everything related to e-learning. This is really helpful! Do you have suggestions for how to get non-techie trainers up to speed? We are doing a lunch and learn next Friday on mobile. I would like to provide as many quick resource guides as possible. I see Studio 13 allows content to be published for Flash, HTML5 and the iPad - presumably because of Apple and Flash. It would be interesting to hear about m-learning applications from others in the community and whether mobile app development is the new frontier? Thanks.